Lance has been facilitating interactive events for the past 13 years. He has helped countless companies from all around Australia, New Zealand & Asia Pacific work together, creating their very own uplifting pieces of music. His background in stress management and knowledge of traditional music from around the world has given him a truly holistic approach to team building. A seasoned kit drummer and live performer, Adam has always found a sense of personal 'calibration' from music. Adam continues to combine his Psychology major with his creative passion that is drumming. Adam is currently endorsed by one of the world's leading cymbal manufacturers Paiste, and has facilitated events nationally and internationally, working with the likes of Hamish & Andy, Julie McCrossin, Steven Jacobs and Adam Spencer. Maxine completed her Bachelor of Arts Degree in Psychology and Drama. She continued her studies and completed, with distinction, a Postgraduate in Education. Her teaching career in Drama spans over nine years. Maxine has worked extensively in Voice Training for Corporate Clientele and compiled training manuals in Communication and Counseling. She furthered her studies in Expressive Therapy in Boston, Massachusetts. The Drum Circle Events team is comprised of performers from right around the globe including Gambia, Guinea, Senegal, Montreal, Uruguay to name a few. These world class musicians began their training and performing from as young as 9 years old, with many of our African drummers honing their skills in music rich villages surrounded by griots (hereditary musicians or ‘culture keepers’). Our African dancers are versed in both traditional and contemporary forms of the arts, receiving prestigious training such as Le Ballet National Du Senegal and direction from with Choreographer Dr Aikins Hyde under the ADAH School of performing Art. These griots now spread their culture and rich musical history here in Australia as well as touring and sharing internationally, including Africa, Japan, Germany, Switzerland, France, Mexico Italy and the US. Our Australian musicians proudly boast rich international training and performance experience, fleshing out the diverse and colorful Drum Circle Events roster. 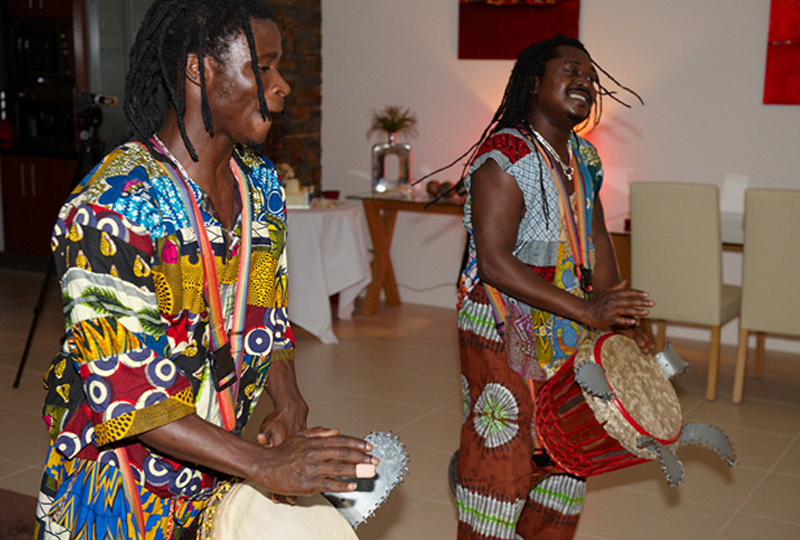 Drum Circle Events… a truly world class team!